Of course, we all know that diamonds are forever, much like your love for your Mama. So what is a better way of symbolising this than our Diamond Initial Necklace, an all time favourite from the collection. Hand engraved with a scrolled initial of your choice, whether that be the initial of your Mum, or the initial of your own name so she can be reminded of you always. What makes this Mum Necklace idea extra special is the sparkly diamond, known to be the symbol of eternal love. 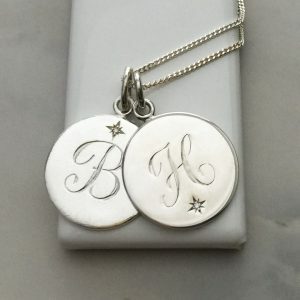 So I know you’ll be getting major brownie points by treating your mum to a gift, but a personalised Mum Necklace that celebrates all her kids is another example and would be the ideal. Our Double Disc Initial Necklace is just the thing, one disc charm for your initial, the other for your sibling’s initial. Have more brothers and sisters? Just drop us a message and we can help you! Mum Necklace, personalised pieces by Bianca Jones Jewellery. For the Superwoman in your Life.